Because Every Child Deserves a Collage Education! ACNE (the American Collage Network for Educators) is a major US support group for high school and middle school teachers using a powerful but misunderstood teaching tool, COLLAGE. ACNE is not just for teachers, but for students and parents as well. It brings all of us together to overcome prejudice against collage. ACNE also provides networking, mentoring, emotional support, empowerment, and justification for thousands of teachers who face the constant hassle of misinformed parents and students who belittle one of the most powerful education tools ever, COLLAGE. What better way to help students get a head? Thanks to ACNE, teachers who use collage can swell with pride. ACNE was founded after concerned parent Jeff Lindsay came face-to-face with his own prejudice and bigotry against collage. At first he couldn't understand why his children in middle school and high school were frequently cutting up magazines to find pictures of tacos instead of learning to speak Spanish, or spending a week cutting out pictures of butterflies instead of learning about biology. How on earth could all this cutting and pasting do anything to prepare my kids for life or employment or college? It's hard to admit how blind I was then. But fortunately, the wisdom of secondary educators soon became clear. Wishing to complain about the lack of teaching in a science class, I went in to confront the teacher, but actually confronted my own ignorance. What a squeeze I was in due to my close-mindedness. I really needed to open up to new possibilities and go with the flow of modern education. It was time to break out of my old way of thinking! You see, collage isn't just about meaningless cutting and pasting. It's not an easy way to use up time or an excuse for a teacher's lack of knowledge or preparation. Collage is about life, rooted in diversity, higher order thinking, and multisensory education. Collage allows students to interact broadly with a topic, allowing inner knowledge to swell and break through the surface, erupting past old paradigms. It's the ultimate in learning tools. I believe that every child deserves a collage education. And as all of us at ACNE know, collage is not just skin deep. Special thanks to Meliah and Julie Lipp for producing most of this collage on April 5, 2003. Doesn't that collage really say it all? It's amazing how much depth and truth can be fit onto a piece of paper when advanced principles of collage are used. But to clear things up even more, read below for more. My goodness, all that cutting and pasting I did before college suddenly made sense. High school prepared me for higher-order thinking more than MIT ever did. We got our collage done--in fact, we impressed NASA by having it done two days before the deadline AND under budget. I was devastated by the recent shuttle disaster, but at least I know I did my job well. And now I'm part of Congressional collage team, where we're helping to show Washington why the disaster was not NASA's fault and why we need even more funding. I was promoted to group leader over the entire shuttle safety program, where we're working hard to improve the attachment of foam insulation to the outside of shuttle. The solution? Cut and paste, of course! (But we've got to find a better adhesive than rubber cement, no matter how high it helps the shuttle team go.) Hats off to the good folks at ACNE for spreading the collage message!" Collage is cost effective. All it takes is scissors, glue, and free waste material like junk mail, old magazines, and NEA publications. Collage is environmentally friendly since it allows magazines and other printed products to be recycled. Collage is good for children who speak any language. NO ENGLISH IS REQUIRED. You don't even have to read. 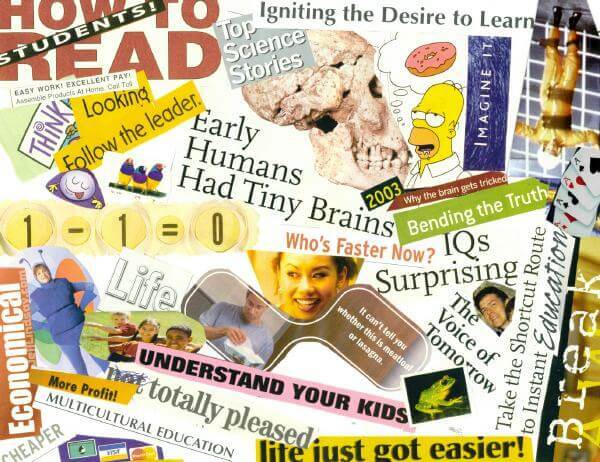 In fact, some of the most expressive collages are made by those who can't read. Collage provides child-centered, hands-on, cooperative education that builds self-esteem and enhances higher-order thinking. Collage can be used for any course, from gym to music to calculus. Collage is developmentally appropriate and is good for all children: IT LEAVES NO CHILD BEHIND! There are no "right" or "wrong" answers with collage, so grades can be given to meet higher-order objectives, like rectifying social injustice, building self-esteem, or bringing equality to snotty students who think they are smarter than other people just because they have higher IQs or high standardized test scores. Collage can prevent strife and conflict. For example, many of the battles over reading programs (phonics vs. whole language) can be avoided simply by focussing on collages instead, making the whole reading issue irrelevant. Here we present testimonials from high school teachers and others who show us how collage has helped them squeeze more out of every student. In fact, you can squeeze every last drop of excellence from any student if you apply collage in the right way. That's what ACNE is all about - helping education to become a well-oiled machine for every student! The physics textbook had this section on momentum and acceleration that just didn't translate into real world terms that any of my kids could related to - and it made no sense to me, either. So instead of being bound by an archaic text, I allowed my students to explore the issues for themselves with collage. I asked them to find pictures of objects that could have velocity, momentum, and acceleration, and explore how these interact in a relevant modern setting. The kids became engaged with this project, which kept them busy for two mind-expanding weeks. We got a lot of great photos of Britney Spears on our walls now, and many of the boys are showing more interest in the physics of moving bodies than before. This breakthrough could not have happened without collage - nor without the great ideas I got from my ACNE Educators' Kit. Thanks, ACNE! I teach four Spanish classes, and each class was becoming bored of learning grammar and vocabulary that they would probably never use. So instead of memorizing irrelevant verbs and conjugations, we spent a week or two doing collage to explore deeper issues in Latin America and Hispanic culture. I wanted the kids to better appreciate the diversity and richness of these cultures, and to break out of old paradigms and stereotypes. So I contacted ACNE and got some great ideas. To begin, I brought in a sombrero catalog, along with some color product brochures for rice, beans, and taco shells. The students really connected. After they all grew more appreciative of Latino culture, we celebrated by going to Taco Bell for lunch. When I learned how much some of my kids were averse to sweating, I knew I needed to find an alternative to the traditional "make 'em sweat" approach to physical education. I mean, good grief, these kids with such fragile self-esteems are trying to be cool, and can't afford to be seen with wet hair after gym class, and especially can't afford to smell like an ox if they skip the shower. Plus, the traditional model of physical activity in class discriminated against the otherly enabled who could catch, run, or jump without making a fool of the themselves. Between the challenges of sweating and the lack of equality among physical abilities, I realized that physical activity could be the worst thing for my students. That's when I turned to collage, thanks to networking with my good friends at ACNE. We spent most of this last semester working on group collages that depict activities that can help burn calories or lead to physical strength. The students, freed from sweating, now felt empowered. Better still, the local library agreed to put up some of our work to celebrate National Physical Fitness Week. Some of the photos were censored by religious bigots, but they couldn't sensor the spirit of success that permeated our work. We could offer dozens more touching stories like these. Across the face of America there is a broad swelling of support for collage education, thanks to ACNE. When I went into business for myself, I found that making money with a small software company was much harder than I ever imagined. Getting investors and customers to read lengthy reports about my products was hopeless - until I remembered the collage education I got in high school. Reams of printed explanation were replaced with cut-and-paste graphical images, and suddenly my software was a hit! I was able to sell more and hire more employees and write more code, until now I am a powerful billionaire. And the tool that gave me success is still instrumental in my company. Hotshot candidates for jobs are screened with collage tests, who literally must cut and paste their way into a job. Users manuals have been replaced with simple collages, and training of our technical support staff - many of whom can't read or speak English - is now made simple with collage-based materials. I think ACNE is great for America, because collage is what every successful business person in America needs - in addition to my software products, of course. That's pretty powerful proof that collage works for America. ACNE: We've Got Education Covered! So, since when did you become an expert on advanced pedagogical practice? Just what are you afraid of? Do new methods scare you? Are you bothered by change? We can arrange for some free counseling. Actually, collage is relevant to your child's future career. Don't you realize that most Fortune 500 companies rely heavily on collage for product launches, engineering projects, quality control, and supply chain management? And if your child is viewed as bright, his or her first assignment in a real job will typically be to help the boss prepare a collage for the next internal review meeting. And did you know that Alan Greenspan's effective use of collage was what got him to be Director of the Federal Reserve Bank? And do you think George W. Bush would ever have made it to the White House without years of collage behind him? We use collage because it reaches ALL the children - not just a few elite ones. Don't you think that every child deserves a great education? Which ones do you think we should leave behind? We've only had complaints from ultra-right-wing fundamentalists. I thought you were more open-minded than that. In addition to dealing with parental threats, we'll continue to pore over the latest breakthroughs in education research to keep America's teachers on the cutting edge of cut-and-paste technology. We're piecing together a fresh new mosaic of best practices and revolutionary concepts that will cut out the old paradigm of "content based education" and replace it with multiphasic multicultural multisensory multi-you-name-it child-centered developmentally appropriate heads-up education that leaves no child behind while putting the child first because together we can do it America! If you would like to join ACNE as a teacher, or a student or parent activist, or just want to make a large cash donation, please contact ACNE Chairperson Jeff Lindsay using the contact information below. Disclaimer The frustrations that led to the idea for this Web page stem from experiences years ago or from the experiences of kids in a variety of schools I am aware of, but NOT with current classes or teachers of any of my kids. Collage can be a great tool in the right setting, but not as a replacement for learning the intended content of a class, as most teachers understand completely. Off the Top: Offshoring of Executives - a service that can help your bottom line by taking a little off the top.